Baz and Benz are friends. But Baz wants to know exactly how much they are friends, and in what circumstances Benz would or wouldn’t like him. What if I turned purple and had spots? What if I said MEEP all the time? With every challenge from Baz, Benz assures him he would still be his friend. But as Baz pushes things further and further, it seems more and more likely Benz may not stick out the friendship. Baz and Benz is a fun and funny bone-tickling picture book by the talented author/illustrator who brought us I Just Ate My Friend. It’s filled with delightful characters, oodles of humour and funky illustrations. 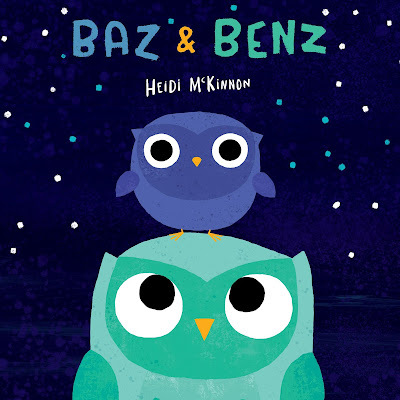 McKinnon has a talent for bringing to life heart-felt AND humour-filled stories that are entertaining and engaging for kids. Baz and Benz hits all these points. I love that McKinnon uses pared back text that gets right to the heart of the story in the fewest number of words. It allows kids to ponder on meaning and provides space for thinking and exploring the illustrations, which are packed with brilliant visual cues for kids and are simply adorable. If you like funny picture books with lots of heart, this one is for you!